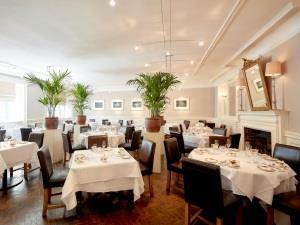 The Angel Hotel Restaurant at The Angel Hotel01873 857121work RestaurantWe offer food and drink all through the day. Breakfast is served in The Wedgewood room from 7.00am - 10.00am and in The Foxhunter Bar from 10.00am - 12.00pm (weekday), 8.00am - 10.00am in The Wedgewood Room and in The Foxhunter Bar from 10.00am - 12.00pm (weekends). Lunch is served from 12.00pm - 2.30pm in The Oak Room and Foxhunter Bar; and the courtyard in the summer months. In the evening the Foxhunter Bar serves food from 6.00pm - 10.00pm, and The Oak Room from 7.00pm - 10.00pm. We offer the same menu in both areas. We offer food and drink all through the day. Breakfast is served in The Wedgewood room from 7.00am - 10.00am and in The Foxhunter Bar from 10.00am - 12.00pm (weekday), 8.00am - 10.00am in The Wedgewood Room and in The Foxhunter Bar from 10.00am - 12.00pm (weekends). The cuisine of our Chef-director, Wesley Hammond, has an AA rosette has been awarded.